It’s a perfect option for those people who are in search of the useful toilet seat. It never required any kinds of breaking the bank. 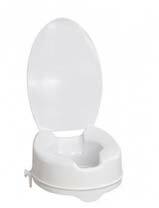 It is quite a durable raised toilet seat that can easily support 275 ins and more than that. Without facing difficulties, you can easily replace the toilet seat. It can be useful for elongated and standard sized toilets. It is convenient as well as portable, it means you can easily transfer this seat from one washroom to another. It is an incredible adaptive toilet seat that works perfectly. It is a suitable product for those, who need any assistance at the time using toilet. 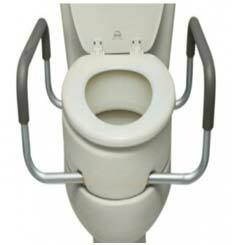 By looking the desire of patient the Vaunn Medical Clamp-on raised toilet seat to provide effective toilet seat. It can convert the regular toilet seat to an identical one. The installation process is quite easy and tool-free. Additionally, you can remove this raised toilet seat easily without any help. It is one of an extra comfortable option in the list of the elevated toilet seat. It’s a lightweight seat that can support weight up to 300 lbs. This toilet seat is more comfortable than others. 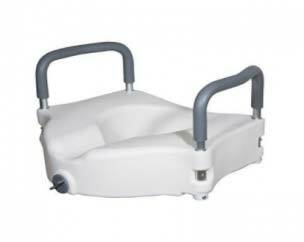 Drive Medical Elevated toilet seat can easily support up to 300 ins weight. For the purpose of setup, you don’t need any kind of tool because you set up easily. It has a clean contoured plastic surface. The best part of choosing this seat it comes with the ability of padded armrest that can be removable. It is quite similar to the drive medical toilet seat. Meanwhile, PCP Molded toilet seat riser can easily be fit in the regular toilet seat because it comes with the 5 inches’ height. It can support 275 lbs weight and easy set up without any tool help. It can be suitable for elongated and standard sized toilets. Additionally, you can lock the seat on your existing toilet. This toilet seat has stability as well as a clasp on tightly, so you never face any kind of issue. It has a smooth plastic, as a result, it is easy to clean, for additional support, there is a permanent padded handle that is not removable. 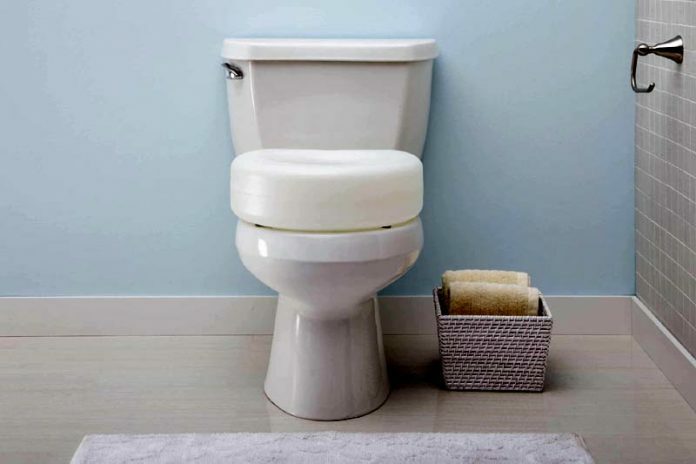 It is slightly different and unique raised toilet seat because it installs under the toilet instead of installing on the top. The existing toilet needs 3.5 inches also support 300 lbs weight. 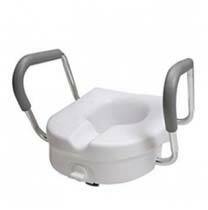 There are two size of Essential Medical Supply Elevated toilet seat that is elongated and standard. When you buy this, you will get an additional install book that provides instruction for installing. The toilet seat has a smooth surface and comes with two arms. 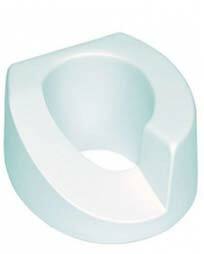 It’s a one-piece toilet seat that is specifically designed for those, who has the surgery of hip replacement. The seat has the height of 4 inches. 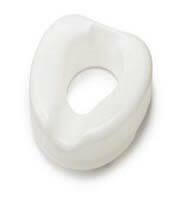 While using this toilet seat you can easily reduce the pressure of your hip. You don’t need any kinds of the tool while installing in your home. The seat has Lok-in-el bracket, which is directly attached to your toilet. It is quite durable as well as lightweight. Tall-Ette can easily lift 300 lbs weight. It can easily clean because of a smooth surface. The best part of using this seat is you can easily transfer it from one toilet to another. Tall-Ette toilet seat has an elongated size. – Specifically, design for hip replacement surgery. This raised toilet seat is also designed for those, who have hip replacement surgery. It’s quite suitable for the elongated toilet sized. Don’t go in the shape of the seat. It has a potential role while providing the patient comfort. Your hip can feel safe and helpful to prevent internal rotations. The height is also same as the previous one that is 4 lbs weight. – optimal comfort during toileting. This toilet seat is also installed under your toilet. It is made up of high-quality plastic that is easy to clean. The height of the Ableware toilet is 3.5 inches that are quite a standard sized. This seat doesn’t have enough weight but easily support 300 lbs weight easily. For installing this seat, you need some tools like the screws that is helpful for attaching the seat. It also has molded-in armrests. The toilet seat size is standard as a result; you can easily transfer it from one toilet to another.